During 2013 we saw problems with the G1215U low expansion glossy that we had been recommending from some years. It was not melting to a completely ultra-transparent (in some cases it fired silky matte). In addition, it was not co-habiting well with cobalt (either in-glaze or under glaze), pinholes were appearing. We are examined possible causes for this and suspected a change in the frit 3249. Formulating an alternative became necessary after efforts to identify the exact cause of the change. It is not easy to find or create an ultra-clear glaze for cone 6. Tiny surface imperfections, boron blue milkiness, bleeding of colors and en-trained micro bubbles that go unnoticed in colored and opaque glazes quickly catch the light and the attention with transparents. Even more evident is the slightest tendency to craze, because of this factor alone it may be necessary to have multiple transparent recipes for different clay bodies. Transparent glazes are by far most likely to be used on porcelains, and unfortunately, porcelains craze glazes more than stonewares. This is because they have less silica to increase the thermal expansion (higher body thermal expansion reduces crazing while lower glaze expansion does the same). But, things that reduce crazing often increase the other problems. For example, more boron melts the glaze better to give a smooth surface, and it reduces thermal expansion; but it causes clouding. Increasing MgO at the expense of Na2O reduces thermal expansion very well but also reduces the gloss. Higher silica reduces thermal expansion (usually not enough to fix a crazing problem) but it raises the melting temperature which increases surface irregularities; if you increase the boron to melt the silica, boron blue clouding appears. Zinc as a flux can help give a better melt, but it is hostile to some colors. Lithium carbonate as a flux causes slurry and color-conflict issues. Since the G1215U glaze was high in MgO, it seemed obvious this needed to be cut to reduce the tendency for the glaze to matte (high magnesia is a classic way to make silky matte glazes). If course, this increased the thermal expansion and therefore the crazing. To lower the thermal expansion we tried a serious of tests that increased the boron to improve melt fluidity and make room for more low expansion SiO2 and Al2O3 (all three are low expansion oxides). Eliminating the crazing in our lowest expansion porcelain required doubling or even tripling the amount of boron to get enough melt fluidity to dissolve the needed SiO2 and Al2O3. So we ended up going back to the original 20x5 G1214M glaze from many years ago (it is a good transparent for stonewares). We added a modest amount of MgO and a little more B2O3 (using Insight software to calculate the mix of materials to yield that chemistry). At first we added the MgO using frit 3249 (which is expensive), but then tried using raw talc instead. Amazingly, it worked, there is no increase in micro-bubbles and it melts just as well (apparently it gases at a time during the firing where this can be tolerated). So, the resulting glaze is much less expensive. -This new glaze is so fluid in the kiln, it is surprising how well melted it is for a recipe having only 23% frit. It runs right clean off our melt fluidity tester. -In comparison with the G1215U transparent that had become troublesome, this one cuts the B2O3 and cuts Al2O3 and SiO2 considerably (while maintaining their ratio). These factors should certainly increase the thermal expansion, but instead it drops! The recipe also calculates to a significantly higher thermal expansion yet it does not craze even on our most troublesome porcelain. What are the dynamics that make it work when logic and the computer says it should not? We will continue to test to try to learn why and to see if the the melting mechanism is stable through firing and material changes. -We have not used any special purpose fluxing oxides like ZnO, Li2O or SrO, small amounts of these are often the magic behind getting glazes to fit. -Common knowledge is that raw materials that decompose and form gases can produce too many bubbles for the melt to pass, so fritted fluxes are preferred. Not so with this glaze, it has more than 29% of materials the decompose to form gases, yet fires crystal clear. -If you are doing over or under-glaze decoration using stains or oxides, they may bleed more that other glazes you are used to (especially with cobalt or cobalt stains). Try testing adjustments to your color medium to make it less fluid. Or use a lower percentage of stain vs medium. -Frit 3134 can precipitate in glaze slurries (it can dissolve). We have a version of the recipe that has the same chemistry and melting behavior but employs a mix of frit 3134 and frit 3124 to source the B2O3 (but it has only 15% kaolin so may tend to powder). -If you suspect your talc is causing micro bubbles, we have a version of the recipe that has the same chemistry but employs Frit 3249 to source the MgO. -If it crazes, you may be able to use Insight software to reduce the KNaO and replace it with some ZnO or Li2O. 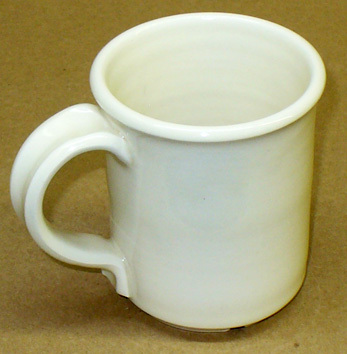 -This glaze may be under too much compression if you use it with some stonewares (especially if on the inside). Use G1214M or W instead. Please contact us with anything you discover so we can adjust this article so others can benefit from your findings. Sept 2013: I will have an even more transparent one than this in the next few weeks. It uses the magic ingredient: A strontium frit. G1216M transparent glaze on Plainsman M370. It is ultra clear and very well melted and does not craze on any porcelain we have tried.